SAN FRANCISCO -- For the first time, Tesla Motors Inc. will charge new vehicle customers in Canada and elsewhere with overage fees to use the company’s nationwide network of charging stations. Tesla, in detailing the pricing structure to help pay for the expansion of its charging network, said it would bill over and above a set yearly limit of about 400 kilowatt-hours, equating to about 1,600 kilometres of driving. The pricing applies to new vehicles ordered after Jan. 15. The company has seven stores and about 25 so-called Supercharging stations in Canada. Tesla’s website indicates a new outlet "opening soon" in Toronto-Oakville, Ont. The pricing move, announced Jan. 12, marks Tesla’s first effort to monetize a service that the company’s electric-car owners have long had for free, a policy that continues for vehicles ordered before Jan. 15. In a blog post Jan. 12 Tesla wrote, “If customers travel beyond their annual credit, they will be charged a small fee to Supercharge.” However, unused credits do not roll over to the next year. Put into financial terms, the rates for Canada range between 14 and 28 cents per minute, depending on province and which tier of service is used for charging. Tier 1 applies to cars charging at or below 60 kilowatts and Tier 2, at twice the price, applies while cars are charging above 60 kilowatts. Tier 2 charging is faster. Tier 1 also applies anytime the vehicle is sharing Supercharger power with another car. Tesla said the charge fee would be about US $15 for a road trip to Los Angeles, Calif., from San Francisco and about US $120 for a cross-country trip. The automaker did not give Canadian examples. 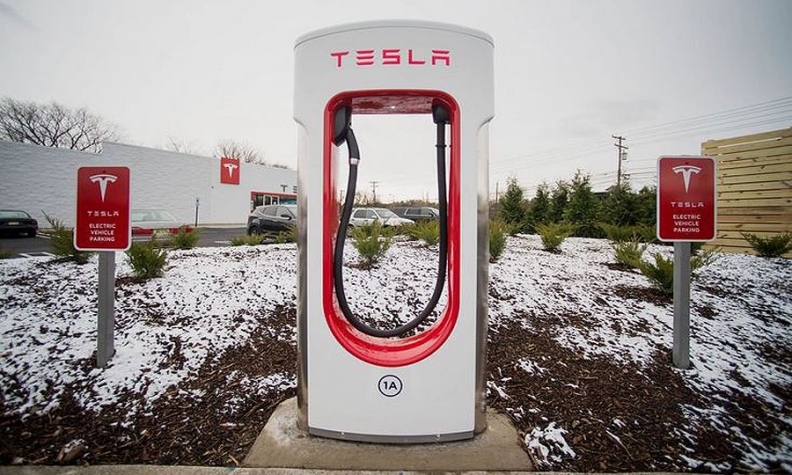 Supercharging stations are available in B.C., Alberta, Ontario and Quebec and are typically located at shopping malls adjacent to highways between major cities. Each of Tesla’s 795 Supercharging stations globally has six to eight spots for cars to park and charge.